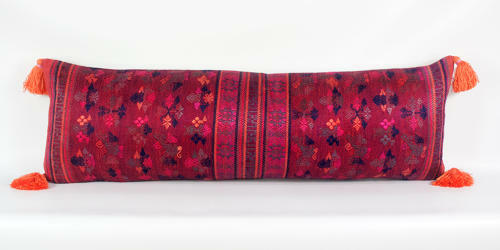 These two beautiful magenta long cushions come from a vintage handwoven silk Maonan wedding blanket. The bright magenta silk ground is decorated with auspicious symbols in orange, pink and blue. There are handmade orange bamboo silk tassels at the corners, a vintage hemp back, zip closure and feather pad. These long cushions are perfect for dressing beds with. Whilst they may appear expensive they take up the space of 2 or more smaller cushions. There are two available and they can be viewed by appointment at my studio in Purley or please ask for a shipping quote. I also offer a concierge service if you are looking for a collection of cushions.